Ballplayer #36, “with hand over the stone”. In contemporary pelota Mixteca a volley is started by bouncing the ball against a flat stone plate on the ground and then it is smacked with a hard glove. 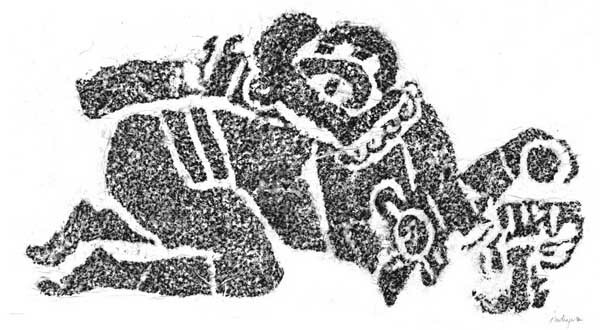 This player is about to repeat that gesture and this "stone" could also contain a carved glyph. If he is about to start a volley, he is creeping up to the starting plate. This is not the stance of someone who is winning.